The drivetrain of the Lamborghini's first Sport Utility Vehicle (SUV), Urus has been revealed. Although not yet confirmed, but Urus rumored to be carrying a 4.0-liter V8 twin turbo and claimed the fastest among the competitors in its class. 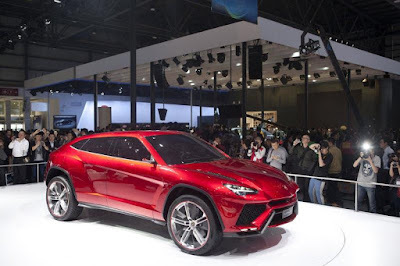 According to Lamborghini's R & D boss, Maurizio Reggiani explained that the competitors such Bentley Bentayga and Porsche Cayenne Turbo S. Acceleration from 0-100 kph in both the Urus SUV competitors reach just 4.1 seconds and while Urus 4 seconds. As reported by the Worldcarfans on Wednesday, December 23, 2015. Reggiani added, although the figures has not been revealed but Urus production model will be lighter than the competitors. Bentley Bentayga has a weight of 2,422 kg and Cayenne 2,235 kg. Its power generated from the 4.0-liter V8 engine is claimed by Reggiani could be more than 600 hp and has a torque of 900 Nm. Although the engine sourced from Audi Q7, but it will be a special setting to produce a different performance.